Family of one of two Hevron-based terrorist kidnappers interrogated in night activities that included arrest of six terrorists. 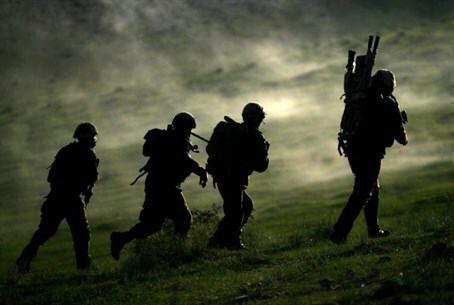 Thousands of IDF soldiers on Monday morning continued the search for Naftali Frenkel (16), Eyal Yifrah (19) and Gilad Sha'ar (16), the three teens who were abducted by Hamas terrorists on June 12. Over the course of Sunday night, IDF forces reportedly broke into the home of Marwan Kawasmeh (29), who was identified by the IDF last Thursday as being behind the kidnapping along with fellow Hamas terrorist Amar Abu-Eisha (33). Walla! noted that the Arab news source Info reported the raid of Kawasmeh's home, adding that his family members were reportedly interrogated. The reports add that a car belonging to Kawasmeh's family was seized, and searches were conducted in several Hevron homes including those in the Kawasmeh hamula (family clan), notes Yedioth Aharonoth. Abu-Eisha's father, who has been arrested in the past for terror activities, as well as other close family members of his have also reportedly been arrested for investigation. Also during the night, six more wanted terrorists were arrested as part of Operation Brother's Keeper, which aims to return the kidnapped teens and crush the Hamas terrorism infrastructure in Judea and Samaria. Likewise, several tests were conducted overnight at the Israel Security Agency (ISA or Shin Bet) forensic science laboratory on intel evidence that was received. Hundreds of ISA members, including the head and deputy head, went to work in the tactical headquarters in the field immediately after the abduction, and have stayed in the field without returning to their homes so as to supply intel to direct the security force's search. An ISA source revealed that his forces are working with all the tools at their disposal, including those in the realms of cyber, sigint (signals intelligence, i.e. intercepting communications), patrolling the ground, humint (human intelligence) and investigation records. All the capabilities of the Shin Bet are being utilized to locate the whereabouts of the missing teens. The source noted that the findings of the thousands of soldiers searching numerous sites in the region "are our main effort, and we act following that." Speaking about the dramatic uptick in rocket fire from Gaza since the kidnapping, in which ten rockets peppered Israel on Monday morning alone, the source noted "we realized that the fire from Gaza is increasing, and we're preparing for that." "We understand that there's a problem with the restraint of the stubborn forces in Gaza, and Hamas despite its will is not succeeding in restraining the different organizations operating in the region. We don't know the reason for this, but in practice the fact that Hamas rules the (Gaza) Strip is what guides our actions," added the source. It should be noted that Hamas Deputy Leader Moussa Abu-Marzouk revealed on his Facebook this week that Hamas has given the rocket launchers a free hand, not arresting a single one in the recent escalation.